Can Fastbraces® fix your smile faster than traditional braces? What do Fastbraces® look like? How much does Fastbraces® cost? Is Fastbraces® safe? Does it hurt? What is a retainer? Do I have to wear one? What happens once I get to Smileworks? What do patients think of their Fastbraces treatment? Fastbraces® is a fast, more affordable way to straighten teeth. Using technological features, the system is able to correct a variety of orthodontic problems in just a few months. The system is simple, elegant and able to handle more complex cases than many of the short term orthodontic systems available today. At Smileworks, we love educating our patients. 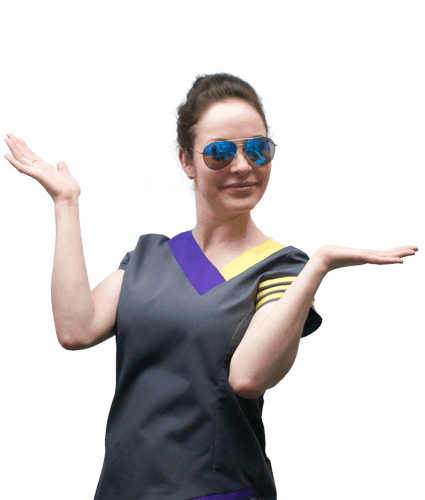 Here are a few FAQs to bring you up to speed on the system that’s in our opinion the best for most patients. The name ‘Fastbraces®’ is misleading because teeth do not move any faster no matter what wire, brackets or types of force you apply to them. Tooth movement is a biological process and there is a great deal of literature that maintains there is a maximum biologically determined speed at which teeth can move. The reason Fastrbraces® claim to move teeth faster is because the cases that general dentists and orthodontists choose for the treatment can be completed in less time. 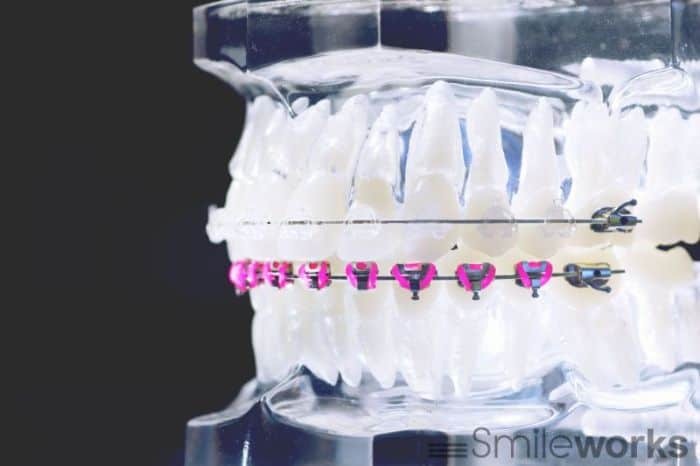 There is a type of braces called Short Term Orthodontics (STO) that is designed to be used by general dentists and is also endorsed by specialist orthodontists. If your case requires complex teeth straightening or an adjustment of the way your teeth meet (your bite) then it’s advisable that you see an orthodontist for your treatment. Here at Smileworks our specialist orthodontist is Dr Laurence Masters. He treats complex cases and his tools and techniques are extremely wide ranging. Do you want a straighter, whiter, more beautiful smile? More importantly, do you want this in months, rather than years? Do you want great results without the hassle of many appointments? If an affordable, comfortable, fast and effective orthodontic treatment is what you’re looking for, most would agree Fastbraces® is a great option. This is an article about Fastbraces®, one of our many different types of braces. If you’re looking for more general advice on Braces take a look at our main page here: Braces Liverpool. And if speed is not your concern but you’re looking for invisible or removable braces then check out our main article on Invisalign®. For an in depth assessment of the cost invisible braces vs fixed, take a look here: Invisalign cost. Fastbraces® pictures show how this minimally invasive procedure sits in the mouth. The unique system is a fast and effective way of straightening teeth. We have all our braces systems in stock and can start work immediately. We offer 0% finance and immediate brace fitting after your initial consultation so you can start straightening immediately and be out of treatment in as little as 120 days! Traditional orthodontic systems work by moving the teeth in two stages: Firstly, the crown of the tooth is moved into the correct position. Then, the roots are moved to align with them. Although this works, it can take many years to complete. Watch this video for more great information on the benefits of Fastbraces®. It’s American and a bit cheesy but the dentists and orthodontists here at Smileworks Liverpool absolutely love it and we show it to all our Fastbraces® patients. An Orthodontist would say that these results can be achieved with any braces system This may be true but this system is not for orthodontists, it’s for general dentists. And as a short term orthodontic treatment we feel it lives up to the claims made on the website and by the fastbraces team. Fastbraces® uses triangular brackets and square wire to move the crown and root simultaneously. Because the whole tooth moves through the jaw, patients can get marvellous results within 3 months to one year. Some even see results faster! Fastbraces® cases require less force to move the teeth than some other systems. This limits the impact on gums while protecting soft tissues. For this reason, Fastbraces is safe and comfortable. It certainly doesn’t hurt although some patients feel some discomfort when their fastbraces have been on for a short amount of time. They’ll typically prefer to eat soft foods for a few weeks until they get used to the braces. So no, it definitely isn’t painful! By moving crowns and roots at the same time, we’re able to quickly straighten your smile. Because teeth love moving around naturally, retainers are needed to keep teeth in their new position. These clear plastic gum-shields only need to be worn 15-20 minutes a day. Unlike most retainers that need to be worn 24/7. 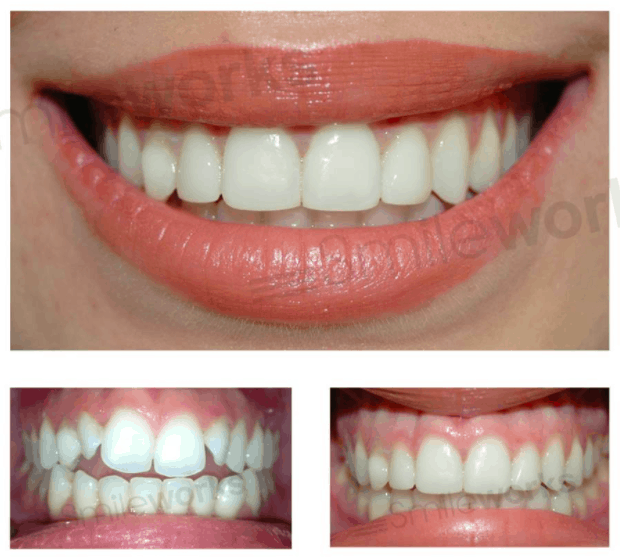 If you get Fastbraces® at Smileworks, we’ll give you Enlighten whitening gel. Put it in your retainer and you can look forward to teeth that are not only straight but beautifully white too. Unlike some traditional braces, Fastbraces® helps preserve our natural bite, creating a more aesthetically pleasing look. The technology works with our teeth and gums, rather than against them. By using one wire and triangular brackets, teeth are allowed to move into position giving supreme results. Some traditional procedures need you to keep retainers in 24/7, but Fastbraces® only needs 15-20 minutes daily. Tooth extraction is rarely needed. Traditional braces often need tooth extraction to make space for movement, but Fastbraces ® is able to move crown and root simultaneously to realign effectively without. Fastbraces® before and after pictures tell the story best. Here we have a video outlining our case studies: You can also find countless examples of positive results on the official Fastbraces® website. With your initial consultation with Dr Rowland-Warmann, you’ll be on your way to beautiful, straight teeth. 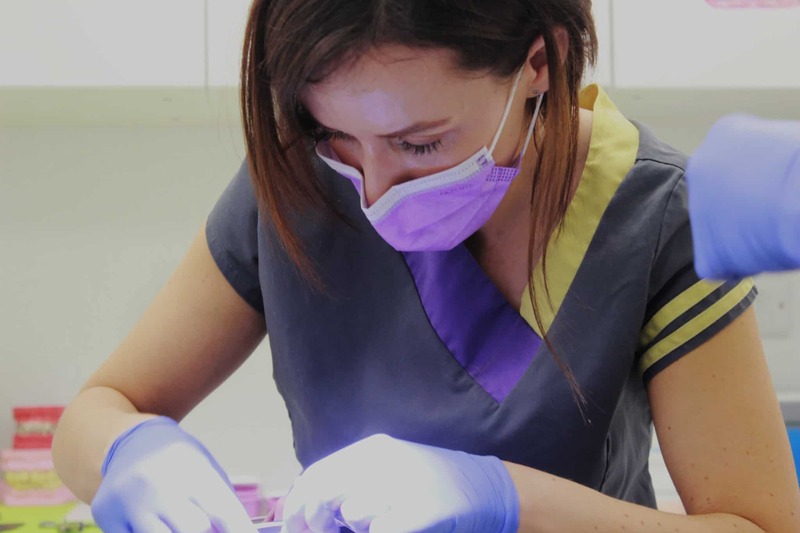 An experienced dentist, she was one of the first to offer Fastbraces® treatment in the UK. After consultation, we’ll take x-rays and put together a comprehensive treatment plan, giving you all the information you need – personalised for your smile! Following this, the brackets are put on and you’ll occasionally come back to Smileworks to make sure everything is going to plan. After teeth are realigned (normally 3 months to one year later), we’ll make you a retainer and start whitening your teeth with Enlighten gel. Why not take a look at our Facebook or Trustpilot to see some of our marvellous patient reviews? Some of our beautiful patients have let us know what they think of us and we are really proud of what you had to say! “I have been going to Smileworks for almost 2 years now. I initially went for a consultation on Fastbraces (on the recommendation of a friend). I was seen by MJ and she was so friendly, made me feel comfortable instantly and explained everything to me in ways I could understand (as I am not the whitest tooth in the mouth… haha…!). I had the brace for around 7 months and I absolutely loved it (I actually miss it now). I thought I would hate wearing it, but MJ and Charlene made it so fun picking different coloured bands, like red & green at Christmas (we even tried to get glitter and glow in the dark ones), that it didn’t make me feel self conscious or hide, in fact it became a great talking point, everyone was always asking about my brace! I also thought it would be really painful as I was only wearing it for a short amount of time and my teeth moved a lot but it really didn’t! I love everyone at Smileworks so much, they have become my friends and I look forward to every visit! I even made my sister go there (she had a small gap in between teeth and dentists she had been to were quoting loads of money for a tooth implant) and MJ fixed it with composite and it looks perfect! I couldn’t thank everyone at Smileworks enough, MJ, Kerry, Charlene, Ed and all the reception girls! You have changed my life and you are never getting rid of me hahahaha! Email reception@sexydentistry.com to make an appointment. Despite that they're very nice people and have a sense of humour, I took an appointment for check up because I had gum infection between two lower back teeth. They made me pay 40 pounds just for checkup between two teeth. As I am student, this is more than a lot to me and I didn't know where to go except them. Anyway, there was no solution 🙂 They took an x-ray and started noting down my teeth details 'where fillings are' and nothing else happened. Normally I don't like writing bad reviews but after the experience I had today I felt like I needed too. I rang up today to register as a new patient and I was interested in both treatments smile works provide which is, braces and lip filler but I also enquired about having emergency treatment due to experiencing pain but who ever the receptionist that I spoke to at around 11:00, was incredibly rude and said "the practice is too busy right now for all these questions, ring later on" which I wasn't happy with but I understand that people can get busy. Anyway I called back around 4:00 and it sounded like the same person and she said " if you wanted an emergency appointment you should of called earlier, there's nothing I can do" which I didn't like hearing but from this experience I thought I should share this and want to put an complaint in as I'm not happy with how unprofessional this practice is. Never experienced anything like it. Please fix your staffs attitude and have better patient care!